Google quietly released a new metric in Google Analytics for ecommerce sites. 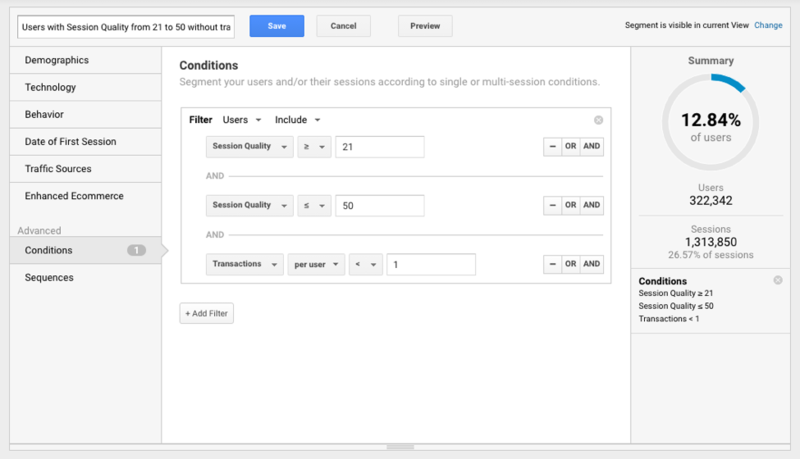 Session Quality now allows you to identify users who have the highest likelihood to convert. 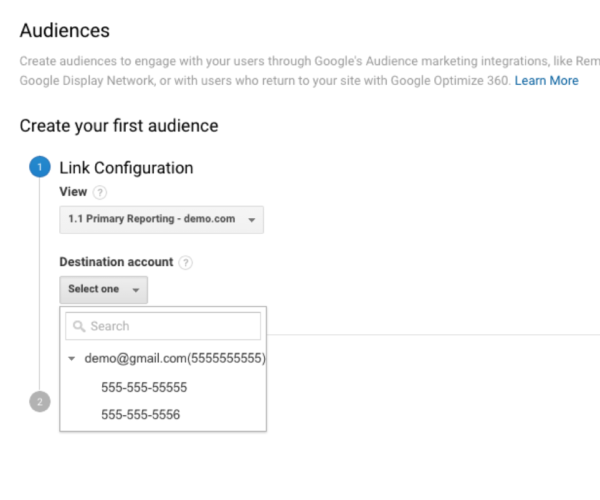 Turning data into action, you can now create segments based on this new metric and target the greatest potentially converting users via remarketing. 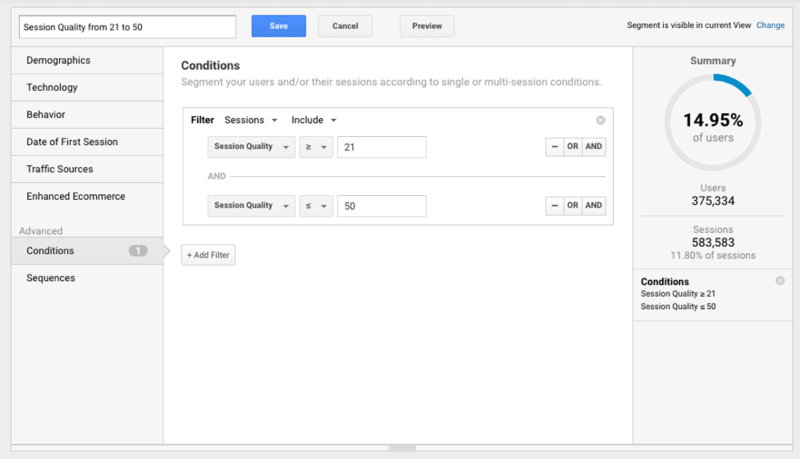 You can learn more about the session quality metric in the Google Analytics Help article. Note there are some minimums required for this metric to work, so you may not see it. As of writing this post, it only applies to ecommerce conversions, so if you are not an ecommerce site and want to leverage this new metric, you will want to identify your top conversions and start sending ecommerce transactions for them. 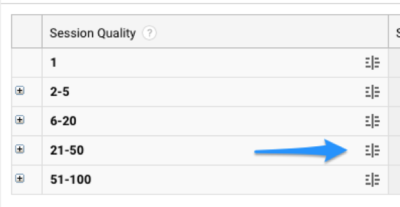 You can find the session quality report in Google Analytics under Acquisition, Behavior, Session Quality. Once here you will see a breakdown of total sessions, their prescribed histogram bucket based on quality, and the number of sessions that do and do not contain transactions. Further, you can see average session quality by the set dimensions. The Default dimension is Channel groupings, however you have a wider array of secondary dimensions available. Now that we know where to find the session quality data, what can we do with it? Google has conveniently added the ability to create a segment right from this UI. The segments they create by default select sessions where the quality score falls within a single histogram bucket. 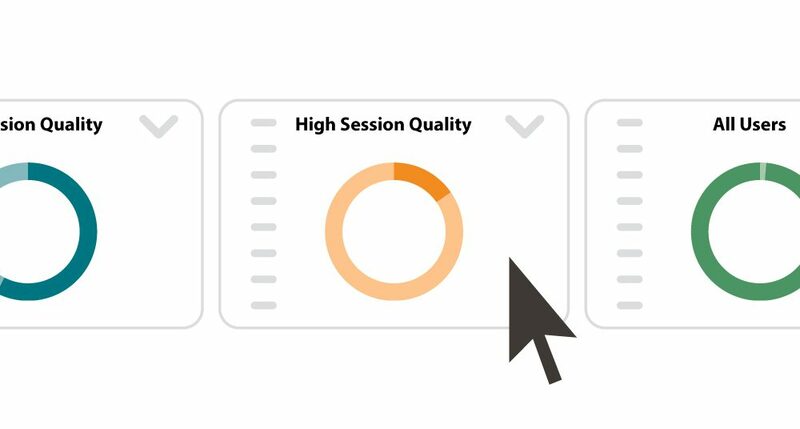 To create this segment, click the segment icon to the right of the session quality bucket. While this is a good starting point, we can do one better. Let’s modify our segment a bit to really hone in our potential customers. First, let’s change the segment scope from sessions to users. From there, let’s eliminate those users with transactions. While valuable, the ads we may retarget them with should be different from customers without a transaction. You’ll notice here I am targeting only scores between 21 and 50. I could open this up to target between 21 and 100, or create a separate list for even more likely to convert customers, where I may be willing to bid even higher. Once my segment is created and appropriately named, then we will turn it into an audience. From here, you select the view and destination accounts you are linking to. Once linked, you are now able to use this audience within the appropriate tool. If you are an Optimize 360 customer, try using this audience to personalize the site experience and give that customer just the little bit of the extra push they need to cross the finish line and convert! Great article! Can you export Session Quality metric into BigQuery ? Thomas, This metric is not in Big Query yet. It would be a great asset to have in Big Query, I agree. Hopefully when it comes out of beta we will see it in Big Query. This metric has been added and is now available in the BQ export as well.